Solar energy delivers positive environmental impacts, contributes to our nation’s energy independence, and provides more jobs than the coal or upstream oil & gas sectors in the United States. To encourage the continued expansion of solar, governments, utilities and other organizations offer solar tax breaks and financial incentives to make solar more accessible for today’s homeowners. As a result, you can reduce the net cost of your solar panel system by anywhere from 30 to 50 percent. What if you lease your solar panels? All of the financial benefits listed below go to the owner of the solar panel system. If you buy your system in cash or with a solar loan, that means you also get the tax credits, rebates, and SRECs for the system. However, if you lease your system, the third-party owner will receive all of the solar incentives. The federal government provides a solar tax credit, known as the investment tax credit (ITC), that allow homeowners and businesses to deduct a portion of their solar costs from their taxes. Both homeowners and businesses qualify for a federal tax credit equal to 30 percent of the cost of their solar panel system minus any cash rebates. Learn more about the federal solar tax credit, including the timeline for the eventual end of the ITC in 2022. Some states offer additional tax credits for installing a solar panel system. With a state solar tax credit, you can deduct a portion of the cost of your solar panel system from your state tax bill, similar to the federal ITC. These amounts vary significantly by state. 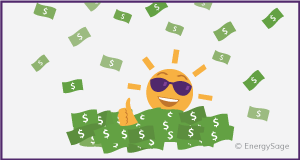 It is sometimes possible to receive a cash rebate from your state, municipality, utility company, or other organization that wants to promote solar energy. Rebates are generally available for a limited time and end once a certain amount of solar has been installed. Rebates can help to further reduce your system costs by 10 to 20 percent. Legislation in some states requires utilities to generate a certain percentage of their electricity from solar power. If you live in one of these states, your system will generate solar renewable energy certificates (SRECs) for the amount of electricity produced by your solar panel systems. Utilities will buy your SRECs so that they can count your solar power towards meeting their requirements. Selling your SRECs can result in hundreds (or even thousands) of dollars more per year in income, depending on the SREC market in your state. Some states or utilities offer performance-based incentives (PBIs), which pay solar energy system owners a per kilowatt-hour credit for the electricity that their systems produce. Certain PBI programs require that you install equipment manufactured in your state to qualify. Unlike SRECs, PBIs don’t have to be sold through a market, and incentive rates are determined when the system is installed. PBIs may replace or exist alongside net metering policies. The Database of State Incentives for Renewables & Efficiency (DSIRE®), developed by North Carolina State University with funding from the Department of Energy, is an all-encompassing source of information about the rebates and incentives that may be available to you. Taking the time and effort needed to research incentives in your state is the best way to ensure that you are aware of all of the incentives for which you qualify. Thanks to accelerated depreciation, businesses can write off the value of their solar energy system through the Modified Accelerated Cost Recovery System (MACRS), which reduces businesses’ tax burden and accelerates returns on solar investments. Qualified solar energy equipment is eligible for a cost recovery period of five years. Accelerated depreciation can reduce net system cost by an additional 30 percent. You may be eligible to finance your solar panel system purchase using a subsidized solar loan with a reduced interest rate. These loans may be offered by your state, a non-government organization or your utility company, but are usually only available for a limited time. Some states and municipalities do not include the value of solar panel systems in property taxes assessments. This means that, even though the value of your property has increased by the addition of a solar power system, your property tax bill won’t increase – it will remain the same. In addition, your solar panel system may be exempted from state sales taxes, which can result in significant additional savings depending on your state’s sales tax rate. EnergySage’s Solar Calculator uses a combination of real-time market pricing data, rooftop satellite imagery, and financial incentive information to give you an initial estimate of how much solar can save you over 20 years. Questions? Our Solar Advisors are standing by to give you the answers you need.